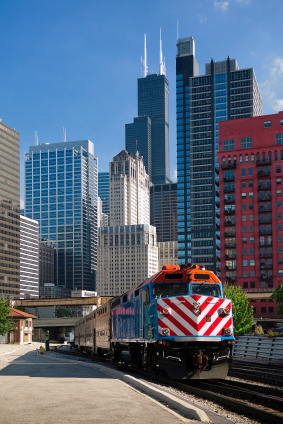 The Metra System is a comfortable and easy way to take advantage of all the interesting, educational, historical and cultural attractions in Chicago and its surrounding suburbs in Northeastern Illinois. Metra can get you where you want to go! The 495-mile Metra system serves more than 100 communities, from 241 stations on 11 train lines in the counties of Cook, DuPage, Lake, Will, McHenry and Kane. From the Metra you can reach Chicago's beautiful lakefront, museums, zoos, sporting events, shops and restaurants, concerts, special events, schools and colleges as well as quaint, historic suburbs and small towns. In some cases, Metra can take you practically to the front door and in other cases, your destination is easily in reach via connecting Pace buses, and/or CTA buses and trains. To Explore Chicago and see what some of the most popular venues are from Metra’s outlying stations, click here. Families can easily use Metra. On weekends and holidays, all youngsters 12-17 ride for half fare and children under 12 ride free when they area accompanied by a fare-paying adult. Additional reduced fares are available to active-duty military and low-income seniors. Fares can be purchased in monthly tickets, 10-ride fare rates or charged per single rides and rates vary depending upon the distance traveled. Schedules, fares and other arrangements are subject to change without notice. Metra does not assume responsibility for errors in timetables, nor for inconveniences resulting from missed stops, missed trains, delayed trains, cancelled trains, failure to make connections or shortages of equipment. However, the metrarail website conveniently reports current delays or problems as they occur. For additional Metra information, schedules, train station locations, maps and more, click here to visit the official website.